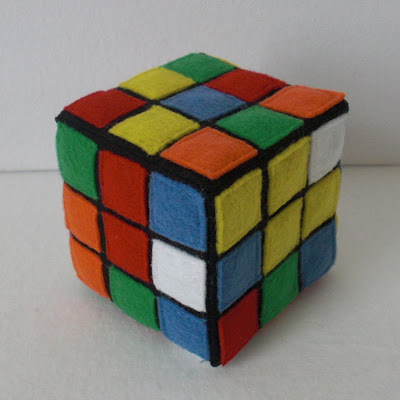 Yeah, so I guess I'm geeky enough to fill the rest of this week with Rubik's Cube projects! Stay tuned for a few goodies! 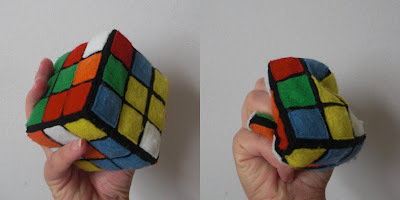 Here is a tutorial for a soft and squishy Rubik's Cube! 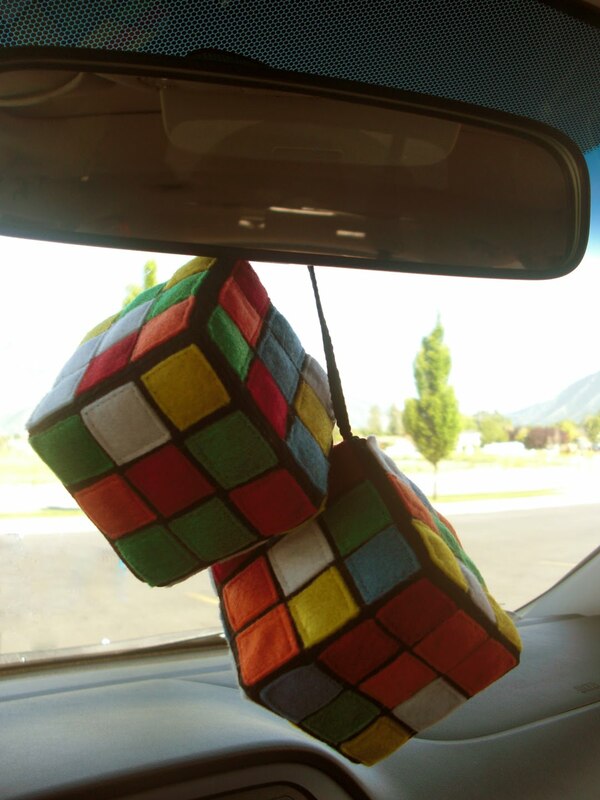 a pair of Fuzzy Rubik's Cubes for Dad's rearview mirror!! STEP ONE: Mix up your cube until you like the pattern/color combination for each side. Using your stickers, label each side. 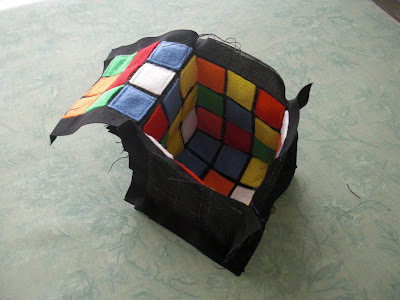 (If we're going to make a Rubik's Cube, we are going to do it ACCURATELY!) I labeled my sides 1-4, the top 5, and the bottom 6. STEP TWO: Cut out a 4" square of freezer paper, with a 3" window centered inside -- each side of your freezer paper square should be 1/2" wide. 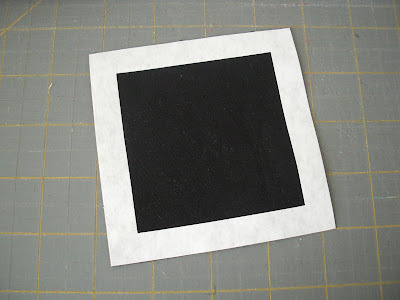 STEP THREE: Using your iron, press your freezer paper template shiny side down to the right side of one black square. 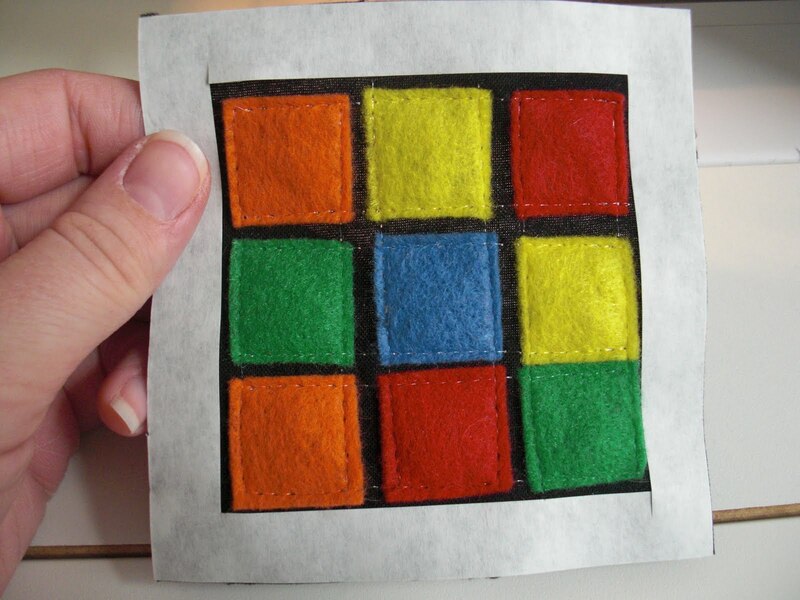 Your freezer paper is now covering the seam allowances of your square. black square. 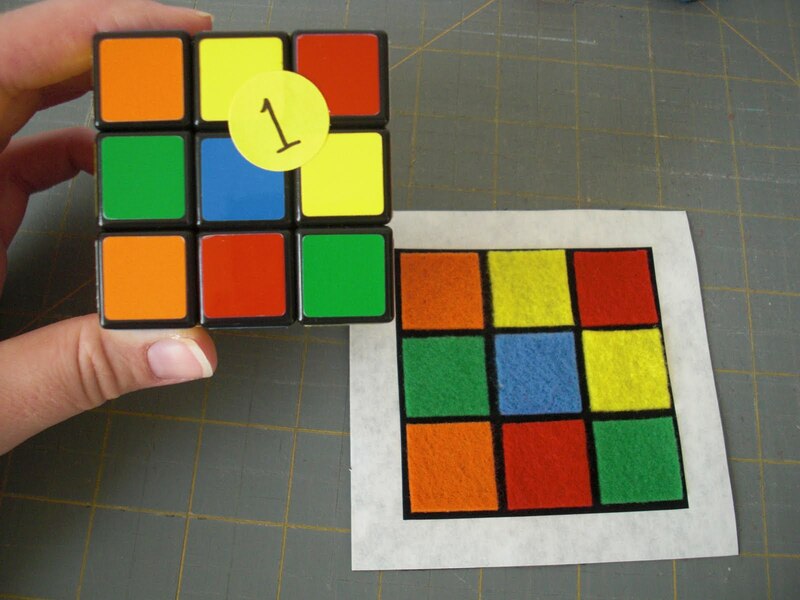 Center them carefully to achieve those Rubik's-esque black lines in between the colored squares. 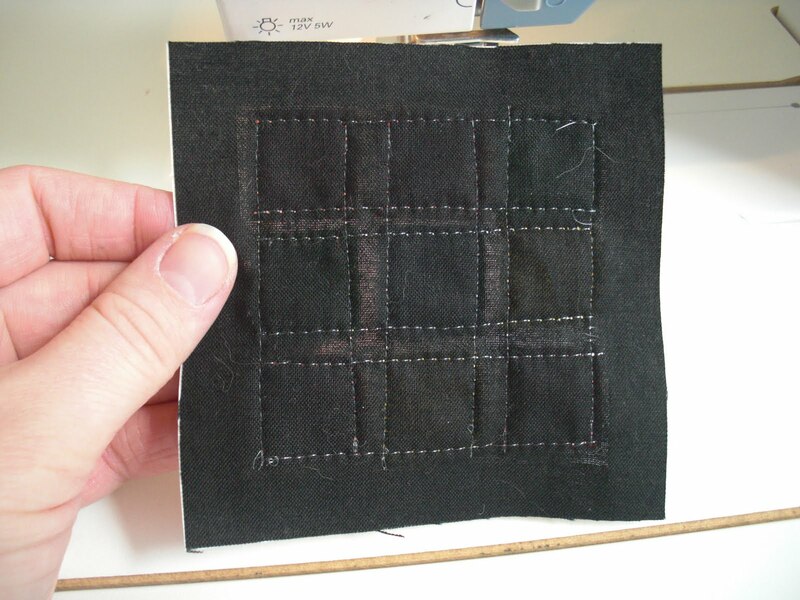 STEP FIVE: Load your machine with monofilament thread and sew your squares down. 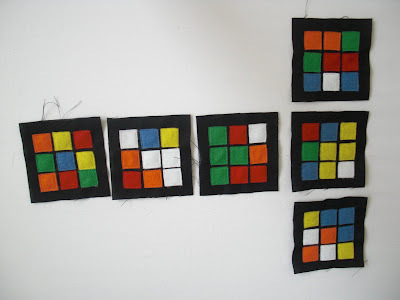 I simply sewed a series of straight lines all the way through each row. 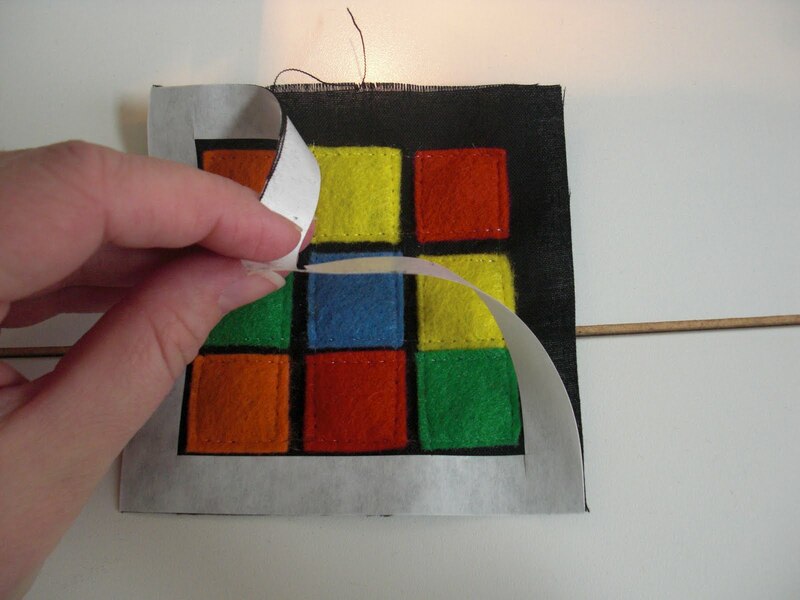 Since the thread is clear, there is no need to stop and start at the end of each felt square. STEP SIX: Peel away your freezer paper template, press it to your next black square, and continue until you have completed all six squares. It helps to keep your squares configured the way they will need to be put together to preserve accuracy of your Cube. 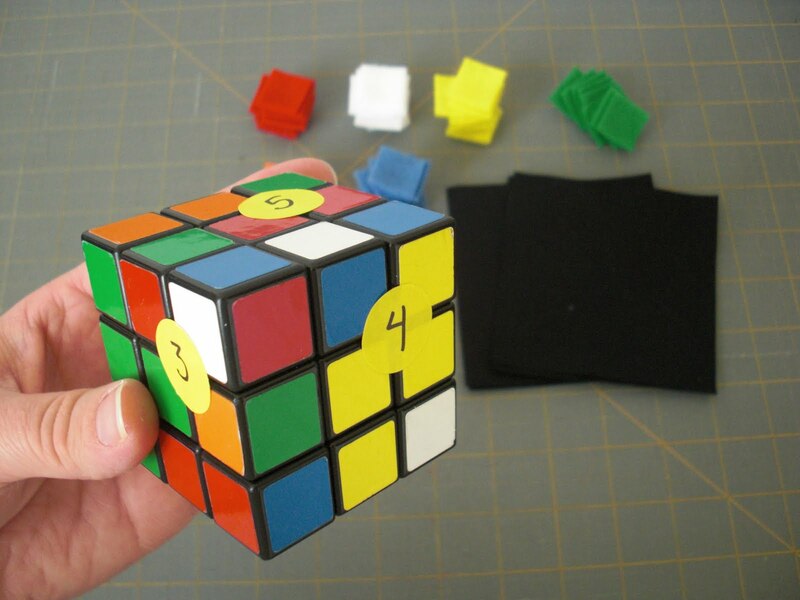 STEP SEVEN: Construct your cube!! 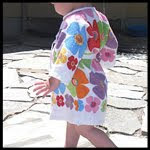 You are sewing with 1/2" seam allowances. For (very!) 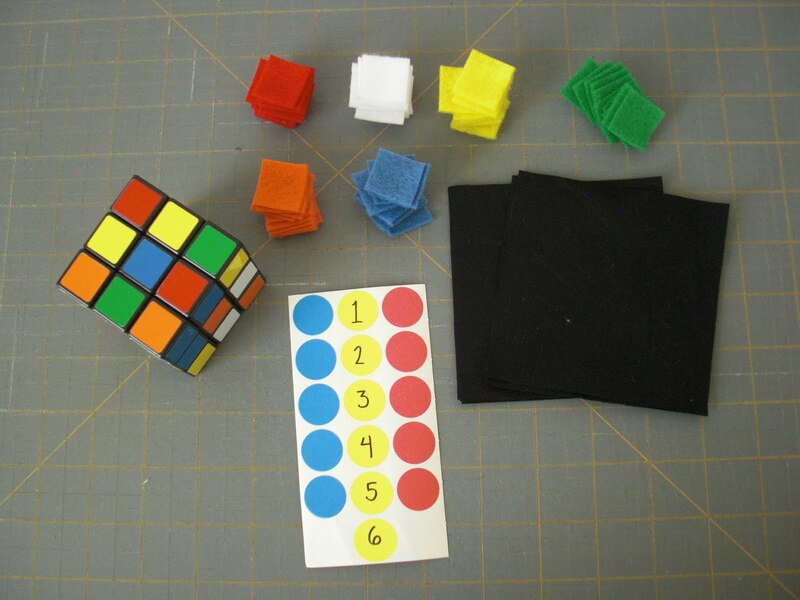 detailed instructions on sewing your cube together, see steps 4-12 in my I-Spy Blocks/Storytelling Dice Tutorial. If you are making a pair of rearview mirror cubes, simply cut a length of shoelace (mine was about 8"), knotting each end to avoid unraveling, and poke one end into the corner of each of your cubes before you finish sewing it closed. 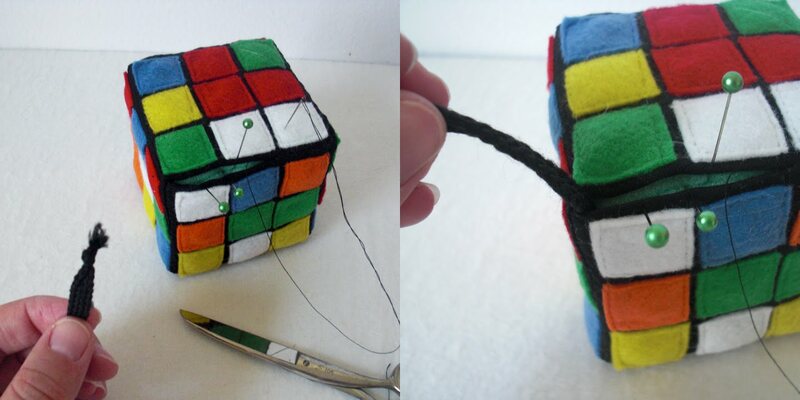 Sew through the knot in the shoelace to secure it. Even though they aren't functional as actual Rubik's Cubes, they are actually a LOT of fun to play with -- especially the high-density foam version. I love to chuck them as hard as possible at the floor and watch them bounce! 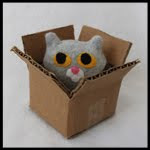 And they are GREAT stress squeezers as well -- no matter how much you squish them, they still pop back into shape! Those are great! I think I may have to make one for my sister who was addicted to the Rubik's cube when they came out! Thanks for the great ideas! How cool is that! I love this mini project! Clever, Clever! I love this creation! 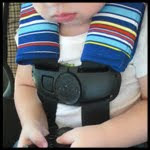 It is so funny-I am going to make this for my Brother and Husband, they will both find it hysterical! Those are AWESOME! I want to make one for my big brother! Too cute & so funny! You're so creative. That's so cool! This makes my inner geek sooo happy! No way, that is so, so cool! What a fun project, thanks so much for the how-to. I'll be linking. 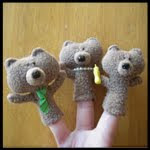 These are tooooo cute! 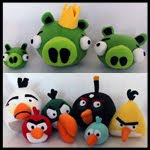 I would love to make some to give away to friends this holiday made with felt from my shop! Thanks for posting this easy tutorial! I love this! 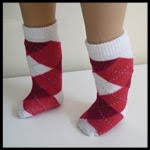 I am featuring on my blog on 7/23! Thank you! I like these!